Harry Pocock with his thrashing machine and tractor in 1958 driving out of Church Street into Broad Street. Edwin, Ruth and Joe Buckingham are on the tractor with him. Before farmers had combine harvesters, Harry went from farm to farm thrashing the corn for farmers. 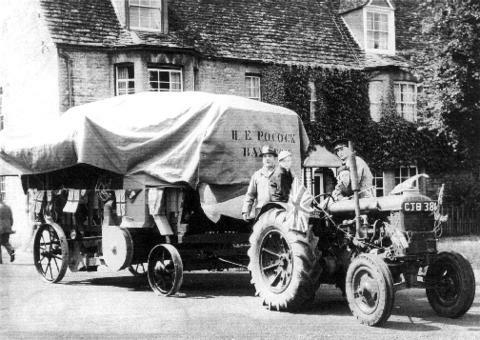 An invoice from Harry Pocock & Son, Agricultural and Thrashing Contractor to Alex Townsend of Ashtree Farm (in Weald Street) for threshing and baling @ £47 5s (£47.25p) but with a contra account of 2ctw of tater (potatoes), 2 men combing and 5 gallons of paraffin £8.11s.6d (£8.55½p) giving a bill of £38.13s.6d (£38.65½p) sent April 1959. An invoice from Harry Pocock & Son, Agricultural and Thrashing Contractor to Alex Townsend of Ashtree Farm (Weald Street) for threshing and baling sent December 1959. Seen in the spring of 1963, talking with Marjorie Pollard in Cheapside, when we had huge drifts of snow.